The seminar schedule for the online Women’s Podcasting Expo, being held July 14-16, 2006, has been announced. Over 25 experts in women’s issues, business and online media will present over 30 seminars and podcasts. The event is a virtual expo, held online. Attendees can interact using a computer microphone and speakers or headphones. Other sessions feature Pat Lynch, of Women’s Radio and other podcasts; Terri Levine of The Coaching Institute; Kelly McCausey of Work At Home Mom Talk Radio; Jody Colvard of The Women In Podcasting Directory; Bonnie Ross Parker of The Joy of Connecting; and Lesley Scott of FashionTribes.com. 3-day tickets for unlimited access to all of the seminars, women’s networking events and seminar recordings are available for $25. Space is limited to the first 500 registrants. 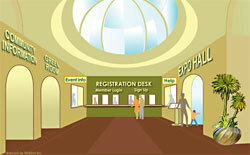 Registration information is available at the Expo site. Disclosure: Podcasting News is participating in the Expo.